Talk to me SE London Week (26th October -2nd November) is an initiative that will be run in the New Cross Gate area with the aim of encouraging people to talk to each other more! Throughout the week, we will distribute button badges that read ‘Talk to me London’. By wearing the badge, you show that you’re curious and open to conversation. We’ll also be organising a series of fun and engaging events in collaboration with local organisations, including a pub quiz, a ‘Talk to me in the library’ day and the ‘Talk Stop Challenge’, where we transform local bus stops into areas where people can talk! 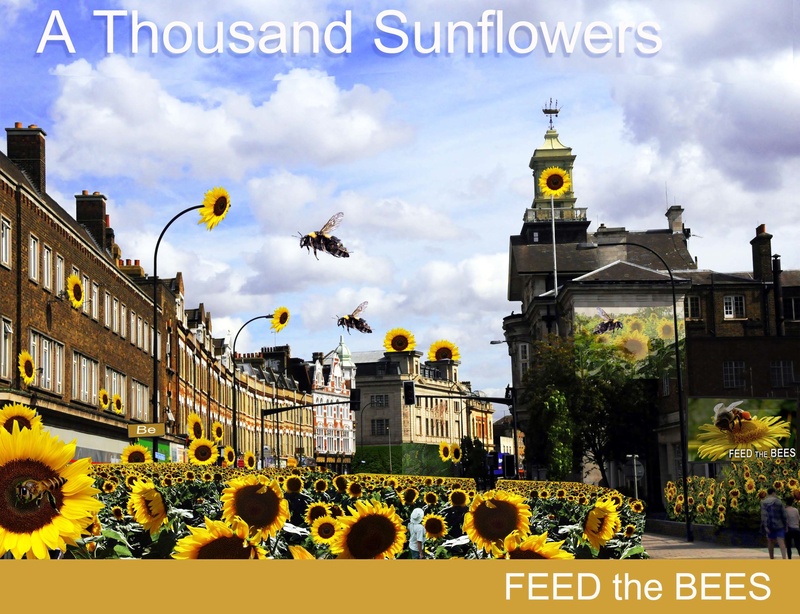 We caught up last week with Dan Hudson, gardener with the community garden learning project Greenshoots on Besson Street and Edmund Waller School, to hear about his work with on the collective 1,000 Sunflowers project in New Cross. Dan has been nurturing about 100 seedlings with the afterschool gardening club at Edmund Waller Primary and about 50 seedlings at Greenshoots’ community garden. More sunflower seedlings being nurtured in private gardens, at schools and in community gardens are being transplanted during June and July, with hopes they will be in full bloom in September. He’s also helped scatter seeds in the scrubby piece of land behind the billboard at the entrance to Sainsbury’s carpark and in the beds at St James. He warns though that planting in public areas mean the plants are under “all the pressures,” listing foot traffic and hungry rodents as a few. The scattered seeds are obviously also at the mercy of the elements: they need six hours of daylight (maybe a struggle in the unpredictable British summer?) and a fair amount of rain (slightly easier to guarantee). Given his caution about the seeds’ success, he said they had decided to “attack on all fronts”, and also scattered wildflower seeds, specifically corn flowers, corn cockles, and poppies, to brighten up some of those less-than-welcoming bits of New Cross in the months ahead. If you’re looking after any sunflowers, send us some pictures (#newxing). If you’re interested in volunteering during the summer to keep the sunflowers going, email us at artmongers.studio@gmail.com. In exploring how creative interventions — what we’re all about here at New X ING —can change the feel of a high street or improve a rundown urban park, we thought we would investigate some local spots where creativity has made a difference. One such space is Angelo Savoia’s Launderette on New Cross Road. We recently spoke with Angelo to hear how introducing artwork changed how people respond to what would normally be an overlooked spot. When Angelo Savoia agreed to let Artmongers and New X-ING’s Patricio Forrester introduce some artistic flair to the Launderette on New Cross Road, he wasn’t expecting to turn the shop front into a local attraction. “It’s been brilliant; it’s a focal point. People come in and give us compliments about it. We get people even now taking photographs,” Savoia says. The focal point is arguably just that. Employing the centuries-old trompe l’oeil (“deceive the eye”) technique in a modern way, Patricio photographed the shop’s gleaming washing machines and then transferred those images to the Launderette’s shop windows. The effect often makes passers-by do a double-take: are the washing machines of that launderette inside or out? “He came along and looked at it from a completely different angle,” Savoia says, adding that originally he had imagined some simple signage to bring in additional customers and ended up with a landmark. 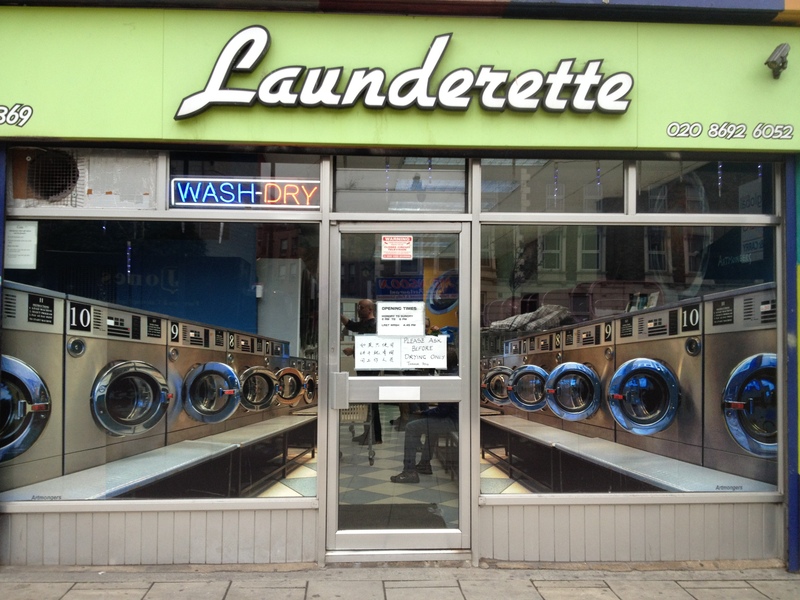 The Launderette’s new frontage came after Patricio unified that particular strip of shops along New Cross Road with waving lines of colour in a project he called the Harmoniser. 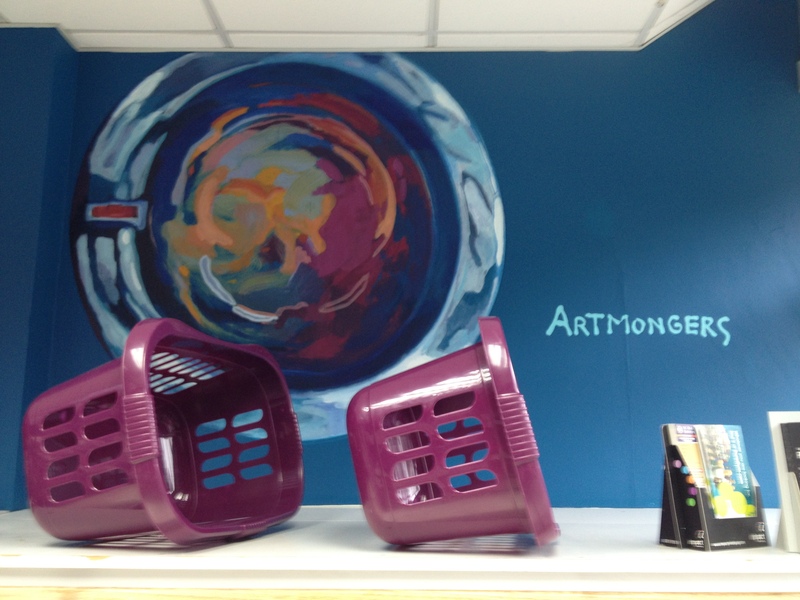 s the “otherworldly” effect of the washing machines on the windows, he painted a space scene scattered by flying saucers, or rather, flying tumble dryers. Again, Savoia had originally agreed to an improvement on the faded magnolia walls with a paint colour with the unlikely name of “Pineapple Twist” but then gamely went along with the flying saucers idea. “People come in saying its just a like an 80’s disco,” chimed in the Launderette’s sparky employee Linda. “I don’t know if that’s an insult or a compliment”. What do you think of the Launderette? Any other spots of successful intervention come to mind? Or spots that could use a shot of creativity? 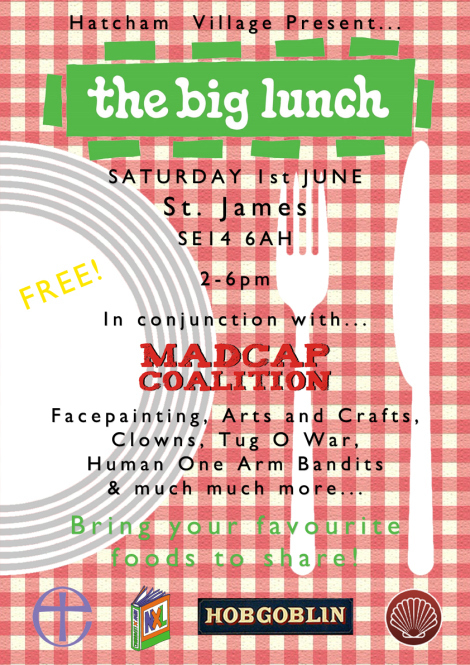 We want to give a shout-out for the second annual Big Lunch at St James this Saturday 1st of June from 2pm to 6pm! The event is organised by New Cross Learning, the Hobgoblin pub, the local school and church, who have all come together as ‘Hatcham Village’. Organisers have already been busy with a big community cooking session earlier this week, preparing a vegetable stew, samosas, German meatballs, and spring rolls. Grow Wild will be running a pop-up kitchen, keeping salads and other such goodies coming. If that isn’t enough to tempt you, the Madcap Coalition will keep the kiddies entertained with face-painting, street dancing, races and much more. Please come, bring your favourite dishes to share, and join in the Big Lunch!